Hump Day is here! Today is Wacky Weiner Wednesday. That’s right. It’s not just your plain old vegan hot dog on a bun with some mustard and sauerkraut. Not that there’s anything wrong with that dog, because every now and again I get me a real hankering for one of them that I succumb to. But, let’s expand our horizons a little today. There are an absolute abundance of wiener-shaped goodies to choose from. My personal favorite for the standard hot dog is Field Roast’s Frankfurters. While there are other companies that produce non-meat hot dogs, you’ll definitely want to read the ingredients because some contain non-vegan ingredients such as egg whites. Let’s not forget about the vegan sausages—such as Field Roast’s Mexican Chipotle, Italian, Smoked Apple Sage, or their Apple Maple (not necessarily for) Breakfast Sausage; or Tofurkey’s Chick’N Apple, Spinach Pesto, Andouille, Kielbasa. Can you see where I’m going with this? In addition to having a wide variety of dogs/sausages to choose from, what you adorn them with has even more possibilities. To give you some ideas, let’s travel around the world…..
Italian Hot Dog: Slice your hot dog crosswise. Do the same for some potatoes, onions, and peppers. Pan fry the potatoes until slightly crisp and golden, then add in the onions and peppers, cooking until almost done. Now have your hot dog join the party in the pan, cooking until heated through. Toss with some crushed red pepper flakes, or not, if you don’t feel like heat. Serve stuffed inside crusty Italian bread. Mangia! Chicago Hot Dog: Using your standard hot dog bun, top your hot dog with dill pickle and cucumber spears, sweet pickled relish, tomatoes, onions, yellow mustard, and a light dusting of celery salt. Philly Dog: Using a hoagie roll, embellish with sautéed peppers and onions, a vegan cheese sauce (such as one of Heidi Ho’s cheeses or similar, or make your own using soaked cashews and nutritional yeast). If you’ve ever been to Philadelphia, you know that there is a little bit of a battle going on. There are many who say that the original Philly Cheesesteak was not, in fact, served with that not-really-cheese sauce but rather with provolone cheese. No worries. We’ve got you covered there with Follow Your Heart’s Provolone. Yo, Adrienne! Grecian Hot Dog: Top the wiener with Tzatziki, Kalamata Olives, and red onions (raw, sautéed, or pickled—your choice). A quick and easy Tzatziki can be whipped up by combining a vegan non-flavored unsweetened yogurt with grated or finely-chopped cucumbers, a dash of freshly-squeezed lemon juice, a sprig of chopped dill, and crushed black pepper. Cajun Boil Hot Dog: Boil a pot of water with Old Bay Seasoning until well scented. Add some sliced potatoes and cook until just fork tender. Add sliced hot dogs to the pot and cook for five minutes, then add some corn (best if you can find some organic corn on the cob in season, slicing the kernels from the cob. If not, go for frozen organic corn kernels) and cook for another minute or two, just until the corn is warmed through. Drain and serve in potato rolls. Sprinkle with a dusting of additional Old Bay Seasoning. 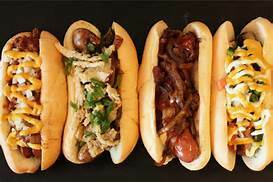 Shanghai Dogs: Dry rub your hot dogs with Chinese five spice and let sit for ten minutes before grilling. While grilling, brush with hoisin sauce (add a touch of water, if necessary, to loosen the hoisin). Serve in a hot dog roll and bedeck with scallions, cilantro, and sliced cucumbers. You can always sprinkle a touch more Chinese five spice and/or the hoisin sauce. Mexican Chimichanga Dogs: Sprinkle a flour tortilla with some chili powder, the roll the hot dog in the tortilla with the chili powder inside. 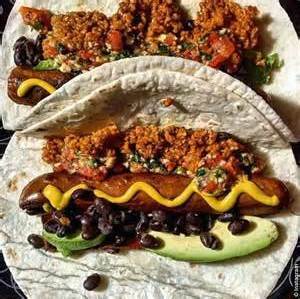 Dip the hot dog tortilla into Vegan Egg that has been constituted according to package directions, then dredge in flour. Deep-fry in 350 degree Fahrenheit oil until golden brown. For a healthier version, plan ahead and park before frying in the refrigerator to set for at least 2 hours or in the freezer for 15-20 minutes. Spray the chimichangas with an organic oil spray and fry, two at a time, in an air fryer (this kitchen appliance is my absolute new favorite toy, I kid you not!…absolutely brilliant). After frying, top with a vegan cheddar cheese and pop in a hot oven to melt the cheese. Serve with vegan sour cream, jalapenos, and salsa. Boston-Baked Terriers: Warm some vegan baked beans. Better still, make your own. Trust me, they are quick and easy, and you won’t regret it. Grab a can of cannellini beans out of our pantry, drain and rinse them. In a touch of oil, saute a small handful of chopped vegan bacon and similar amount of chopped onions until golden, then add the beans, about 1/3-1/2 cup ketchup, similar amount of water, about a tablespoon of unrefined dark sugar, a dab of mustard (any kind will do), a smidge of liquid smoke (optional), and a splash of cider vinegar. Cook for about 10-15 minutes or until thickened. You will not be disappointed. Grill your hot dogs and buns. Assemble your terriers and enjoy. California Hot Dog: Using a whole wheat hot dog bun or roll, garnish your hot dog with sliced avocado, chopped red onion, sprouts tossed in a touch of tamari or namu shoyu, and black sesame seeds. Tuscan Hot Dog: Make bruschetta by seeding and chopping tomatoes. Add minced garlic, fresh basil, a splash of good balsamic vinegar and olive oil, and salt/pepper/crushed red peppers flakes to taste. Slather this yumminess on your hot dog, which is awaiting its studding in an Italian roll. Hawaiian Hot Dog: Sauté sliced red onion and red peppers in a pan. When they are soft, add some diced canned/drained pineapple, scallions, a sprinkling of teriyaki sauce, cayenne, salt, and pepper to taste. I’m sure you can come up with a bunch of other variations. Go for it. It is, after all, Wacky Wiener Wednesday!